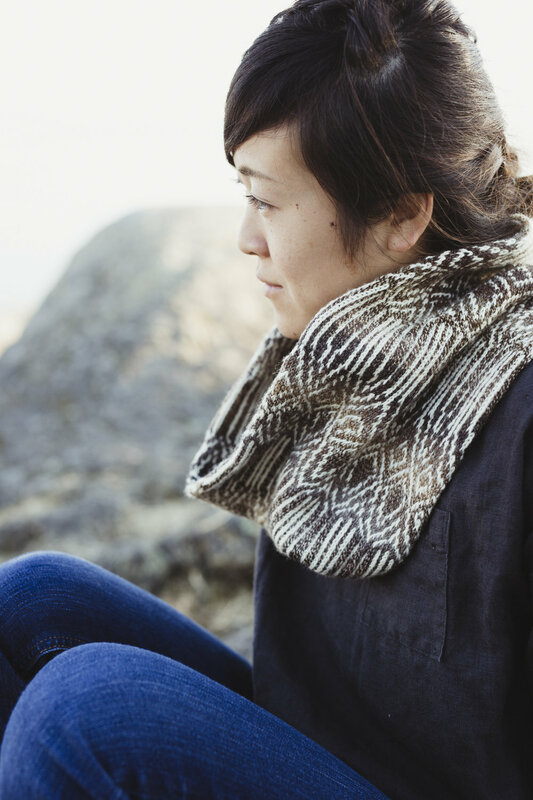 I designed Tolt River to be a cowl pattern that could be a great first colour work project. With that in mind, I’m creating a little guided tour of the pattern to help newbie colour knitters get started. Today I’m going to talk about yarn selection. The pattern is one that could make a great stash buster, so take these tips and have fun shopping in your own stash or use this new pattern (and taking on the challenge of a new skill!) as a good reason to buy something special and new. Tolt River is written for two weights - DK and worsted - so choose whichever you prefer. Worsted, of course, is a bit quicker to knit since it requires fewer stitches to get a similar circumference, but both versions are straight-forward. I recommend wool mostly because it’s easiest to work with, particularly if you’re new to colour work. 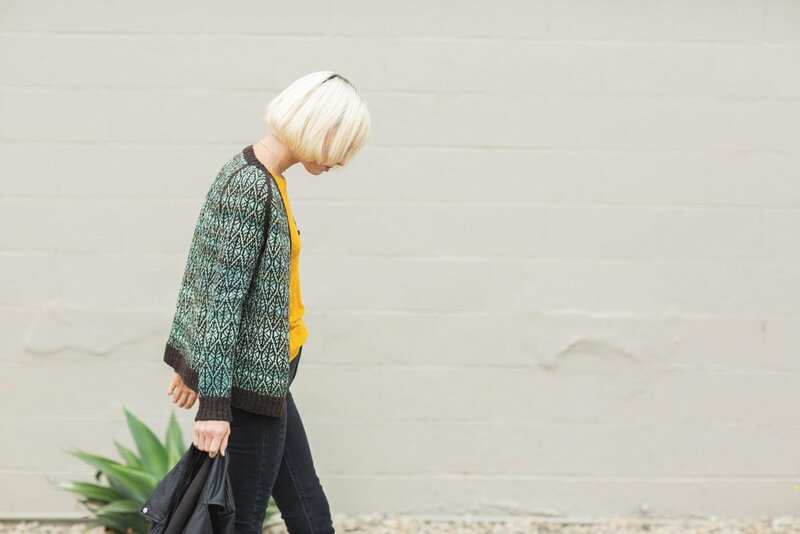 It’s bouncy and more forgiving of tension issues than fibres with less elasticity like cotton, silk, and alpaca. The worsted version in the pattern calls for O-Wool Balance, a 50/50 cotton wool blend, which is a good compromise if you don’t want to work with 100% wool. You may also want to choose yarns that aren’t superwash. The superwash process can make already slippery yarns like Merino even more slick and less bouncy - that makes it more challenging to maintain an even tension because stitches can easily grow too loose or too tight if you’re not practiced and vigilant. Since the cowl will be worn directly on the neck, softness is important too. I really love Local Color Fiber Studio Rambouillet DK, the yarn I used for the DK sample, because it’s super soft, nice and grippy, and has a lovely bounce to it. Another breed that offers softness with bounce is Cormo - I’m a big fan of Sincere Sheep’s Cormo and it comes in both sport and worsted weights. It can be helpful to use colours that have a really strong contrast with each other in order to get best results, particularly if you’re a beginner. To find out if your yarns contrast well against each other, take a picture of them together with the black-and-white filter on your phone. A black-and-white image will give you really great information about how strongly your colours contrast that can be difficult to see with regular vision. If you want to make the four-colour version, just be sure that the colours that will be used together have a strong contrast with each other. So Colour A should contrast with Colour B, and C should contrast with Colours B and D. If you’d like a subtler look, low-contrast yarns can be really lovely too. Check out this WIP from Anna of Tolt for an example of that. She’s using Abundant Earth Verdant in light gray and white. Some folks have asked me if it’s okay to mix yarns - like use one brand of yarn for Colour A and a different brand for Colour B. It’s definitely possible, but I don’t usually recommend it, especially not on a first try. Maintaining tension is tricky enough when you’re new at colour work, and having two different yarns just makes it that much harder. 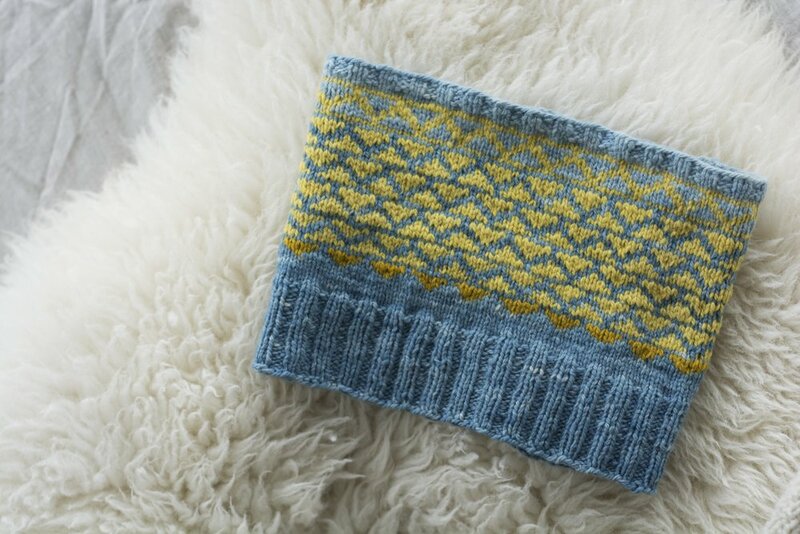 That being said, if you do want to branch out and try something a little funky, just swatch! Yes, of course I want you to swatch for this project even though it is little. Unless, of course, you want your cowl to be your swatch, which is fine too. Just don’t expect to get gauge on the first try!